Congratulations!!!! That is amazing news. I’m so beyond excited for you and Gage. HUGS TO ALL! Congratulations to Gage and Mama for making it to “Maintenance” stage. I completely know how that feels. I hope he is okay from his LP. I didn’t know they would actually do an LP with a child awake, esp at Gage’s age, wow. Here at our hospital, everytime there is LP, they put him down with anesthesia. Was it an option for you guys to choose to stay awake? I’m so excited for you guys 🙂 Just 2.5 more years! Whoo-hoo! Yes! Yes! YES!!!!!! Congratulations mama! We are overjoyed for you! Hurray !!! Love and prayers for you all ! yaaaaay! gage this is awesome! totally new you would pass, you were just keeping us on our toes! cant wait to spend this summer with you! i love you cutie pie! see you in a month! I do a little happy dance. I’m sure your did a summersault into happy happy joy joy. Then pinched yourself. LOVE! Gage and you are always in my healing thoughts. Pingback: Lifencompass » Blog Archive » Weekly Roundup: favorite blog’s. Freaking Fabulous! Loved getting that text at work, let me tell you! Love you all so much! We love you Gagers! So happy to hear you are in maintenance and on your way to destroying this stupid cancer. Two and half and we can celebrate your strength and incredible journey at Disney World! You are such a great mom – I admire how strong you are being for Gage. It sounds like he is doing great! Congratulations on the Maintenance phase! 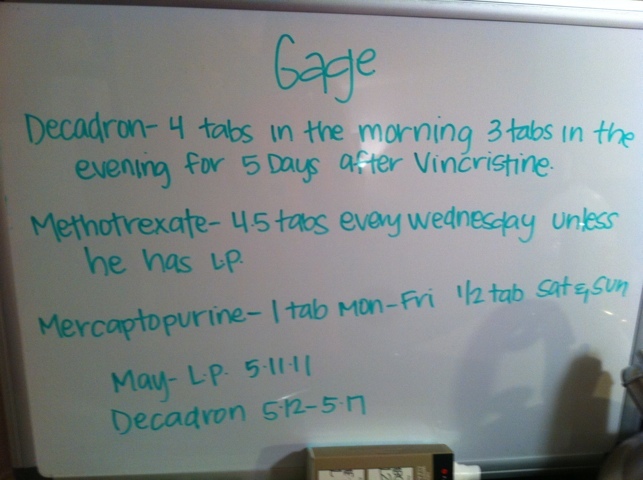 You inspire me… Way to go Gage!!!!! Yyaaaaayyyyy!!!! I’m so happy for you! !